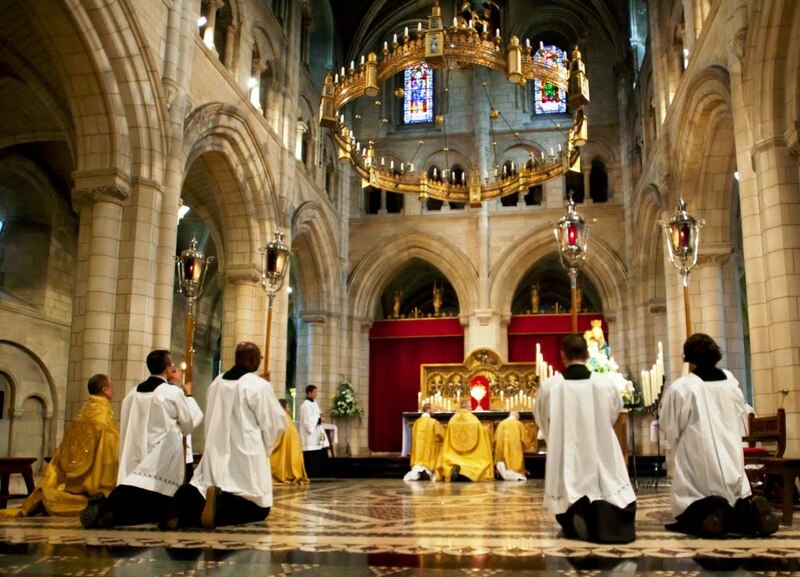 "The Attractive Power of Liturgical Beauty"
Time For a Papal Motu Proprio on Sacred Music? From the Breviary of St. Pius V, 1568, a reading from the fourth Mystagogical Catechesis of St. Cyril, bishop of Jerusalem and Doctor of the Church, appointed for the Octave Day of Corpus Christi. The teaching of blessed Paul seems of itself amply sufficient to make certain your faith concerning the Divine Mysteries; and you, having been made worthy thereof, have become, so to speak, of one Body and of one Blood with Christ. For he proclaimed that on the night He was betrayed, our Lord Jesus Christ took bread, and when He had given thanks, He broke it, and gave it to His disciples, saying: Take, and eat, this is my Body. And taking the cup, and giving thanks, He said: Take this, and drink; this is my Blood. Since therefore He Himself has proclaimed this and said, “This is my Body”, who will dare henceforth to doubt that it is so? And since He again has said so insistently “This is my Blood”, who would ever doubt, and say that it is not his Blood? Once, at Cana in Galilee, He turned water into wine, which has a certain similarity to blood; and shall we think him too little worthy of our belief, when He said He would turn wine into Blood? Being called to that marriage, by which two bodies are joined, He did this miracle, which none expected. Shall we not all the more firmly believe that He has given us His Body and Blood, to be our food and drink, and thus receive them with all certainty as His Body and his Blood? For under the appearance of bread He gives us His Body, and under the appearance of wine, His Blood, so that when you shall receive it, you may taste the Body and Blood of Christ, being made a partaker of the same Body and Blood. 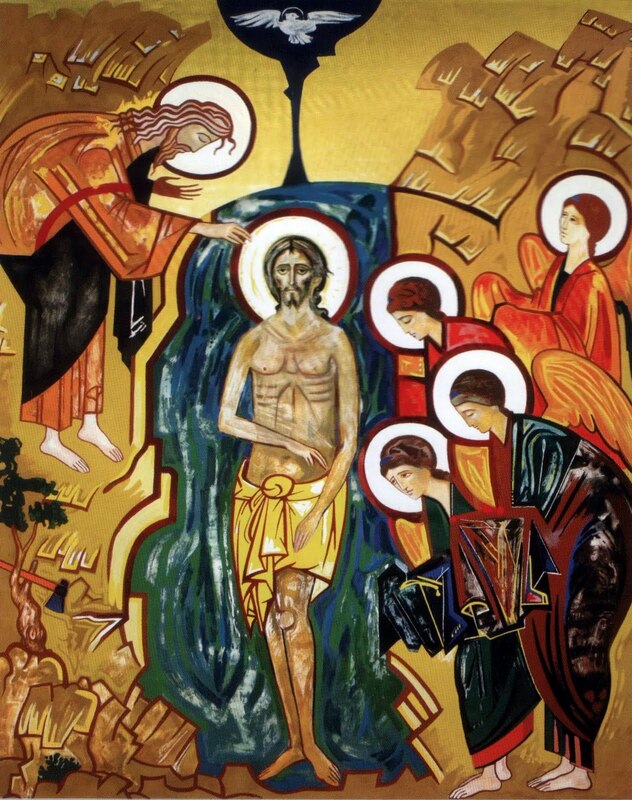 Thus indeed do we become Christ-bearers, that is, bearing Christ in our bodies, when we receive His Body and Blood into our members; thus, according to the blessed Peter, do we come to share in the divine nature. …Wherefore I would not have you understand these things, as if they were merely and simply bread, merely and simply wine; for they are the Body and Blood of Christ. For even if your senses deny this fact, yet let faith confirm you in this belief. Judge not the thing by the taste thereof, but let faith assure thee beyond all doubt, that you have been made worthy to partake of the Body and Blood of Christ. When St. Thomas Aquinas composed the office of Corpus Christi, known from its first antiphon as Sacerdos in aeternum, he wrote not only the musical texts such as the antiphons and hymns, but also the sermon to be read in the first and second nocturns of Matins, according to the custom of his times. This sermon, Immensa divinae largitatis beneficia, is found in almost all pre-Tridentine breviaries; however, it is not long enough to provide readings for Matins on each day of the octave. Other readings had therefore to be selected for the remaining days; the bull Transiturus by which Pope Urban IV promulgated the feast was a popular choice. The 1529 Breviary of the Roman Curia has readings from another bull, Si Dominum in sanctis of Clement V, confirming that of Pope Urban; at Bamberg, Eugenius IV's Excellentissimi Corporis, granting or confirming a long list of indulgences attached to the observation of Corpus Christi, was read as the sixth lesson of Matins on the feast itself. (This single reading occupies almost 140 lines!) The Sarum Breviary gives several very long tracts from the Decree of Gratian, broadly speaking the medieval code of Canon Law; the third part, called On Consecration, is a long florilegium of texts from the Church Fathers and various other sources, and is quite suitable for spiritual reading despite being essentially a law textbook. 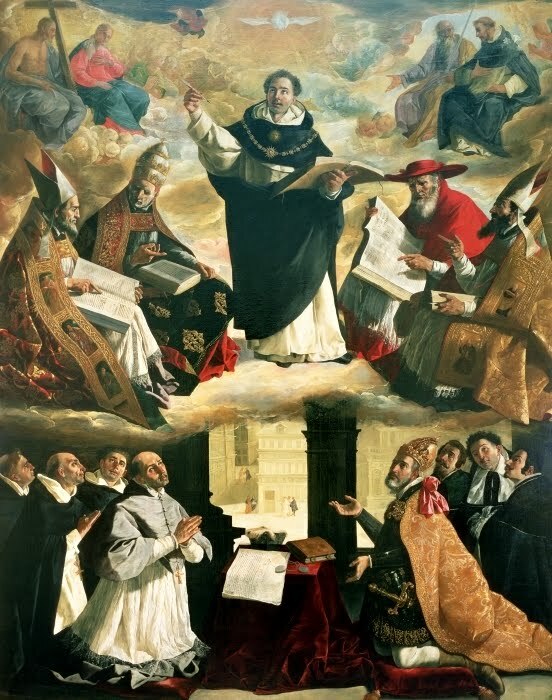 St. Thomas Aquinas in glory among the Doctors of the Church, by Francisco de Zurbarán, 1631. When the Roman Breviary was revised after the Council of Trent, almost all of these passages were substituted with readings from the Fathers of the Church. The sermon of St. Thomas remains on the feast itself and the following day; the remaining days of the octave are given over to Saints John Chrysostom, Cyprian and Ambrose, and last of all, on the octave itself, the passage quoted above from St. Cyril of Jerusalem. It is not difficult to see in the choice of such readings a response by the Catholic Church to the early Protestants, and their rejection of the traditional doctrine of the Eucharist. Papal bulls or medieval canon law collections would hold no authority with the “reformers” of the age (Martin Luther burned both at Wittenberg), whether openly Protestant or uncertain Catholics, who were many in that age. The writings of the Fathers, on the other hand, were frequently appealed to as proof that the teachings of the Protestants were in fact those of the primitive Church, and things like Eucharistic processions and Adoration later corruptions of the Medieval era. In such a climate, the writings of St. Cyril in particular were a source of profoundest embarrassment to early and later Protestant controversialists. By including such a passage in a corpus of sermons that begins with a work of St. Thomas Aquinas, the Breviary of St. Pius V asserts a continuity of doctrine from St. Paul to the Church Fathers to the greatest theologian of the medieval, scholastic tradition. 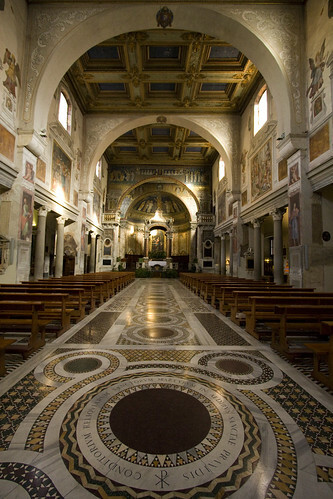 The basilica of Santa Prassede in Rome was re-built by Pope Paschal I, c.822, principally as a resting place for the relics of the Roman martyrs. 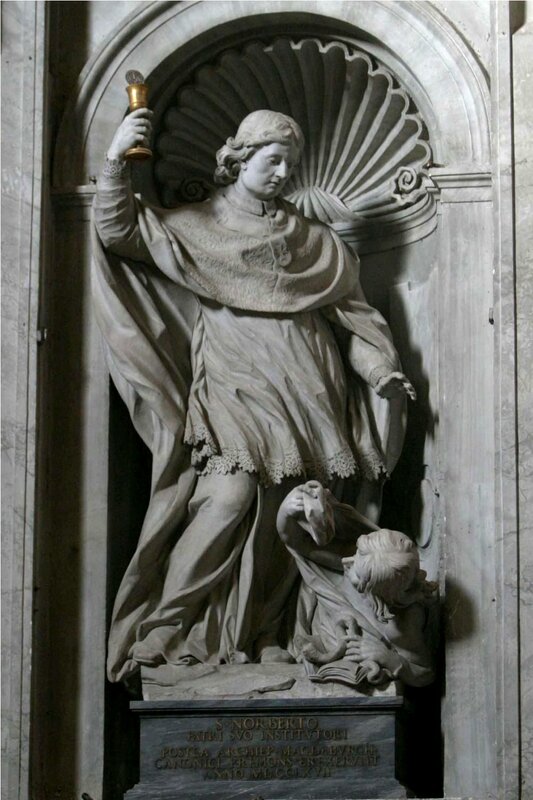 He removed their remains from the various catacombs outside the walls of Rome so that they could be venerated in one place by pilgrims coming to Rome. 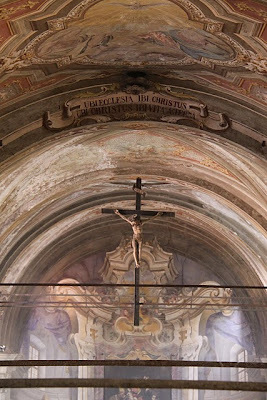 Hence the inscription in the apse of the basilica records that "the Supreme Pontiff Paschal, raised to the Apostolic See... collected the bodies of numerous saints and laid them beneath these walls". Many centuries later, St Charles Borromeo, whose cardinalatial church this was, inserted little balconies flanking the apse where the relics could be displayed. 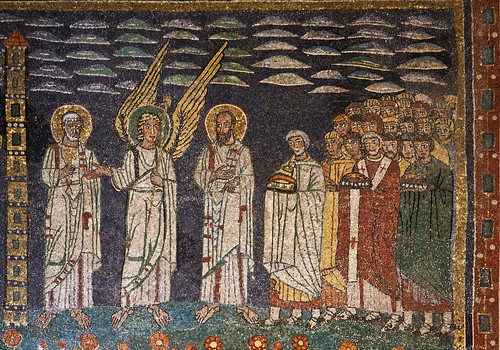 The 9th-century mosaics in the apse and on the triumphal arch of the church depict the martyrs and saints entering into the glory of the new Jerusalem. In fact, Rome has been likened to the heavenly city, into which the relics of the martyrs have been gathered in this basilica. 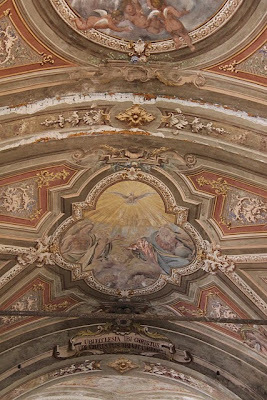 The detail above seems especially fitting, for just as the liturgical celebration of the First Martyrs of Rome follows on today (30 June) from the feast of Ss Peter and Paul, so the martyrs, holding their crowns of victory, are shown following the Princes of the Apostles (who are escorted by an angel) into the glory of heaven. Also worth noting, on this day after which many Archbishops have received their pallia, is the pallium worn by the central figure among the group of saints on the right, and also the full ancient form of the chasuble in which he is dressed. 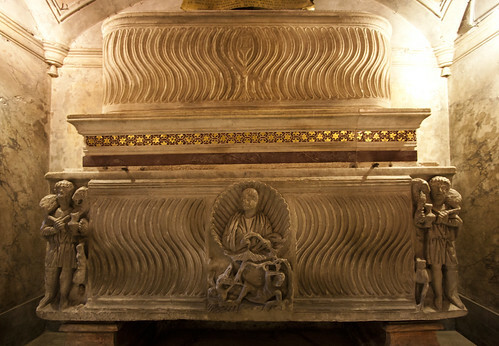 Below is a photo of two beautifully carved sarcophagi from the same period into which Pope Paschal I placed still more relics of martyrs who had been buried in the catacombs. The early Christian motifs of Christ the Good Shepherd, and Jonah have been carved onto the bottom one. Both are symbols of Christian hope in the resurrection of the dead. I am grateful to have had the following article pointed out to me yesterday: ICEL’s Executive Director: New Missal Translation ‘Long Overdue’. Although Catholics have become accustomed to the current translation of the Roman missal and some may wonder why a new one is being introduced, Msgr. Andrew Wadsworth, who is executive director of the International Commission on English in the Liturgy — which prepared the forthcoming translation that debuts in Catholic churches in the U.S. on the First Sunday of Advent — says it was high time for a revision. 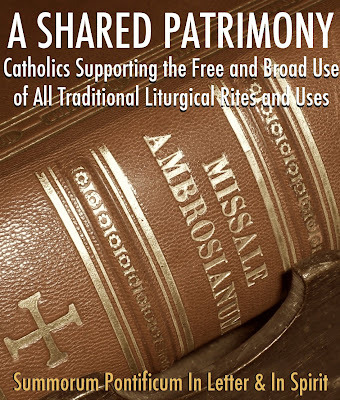 “When our current translation of the Roman Missal — the first English version — was implemented in 1973, it was recognized that it would need revision in time. Many people thought it would be only five years before it was revised,” he said. “That was over 40 years ago, so such a revision is long overdue. Many ancient prayers added dignity and gravity through the use of repetition, and this will be restored in the new version. Despite the broad liturgical standardization after the council of Trent, Liège maintained its own proper medieval use, edited according to certain criteria of the Tridentine reform, until the French Revolution ended the independence of the city’s Prince-Bishopric. 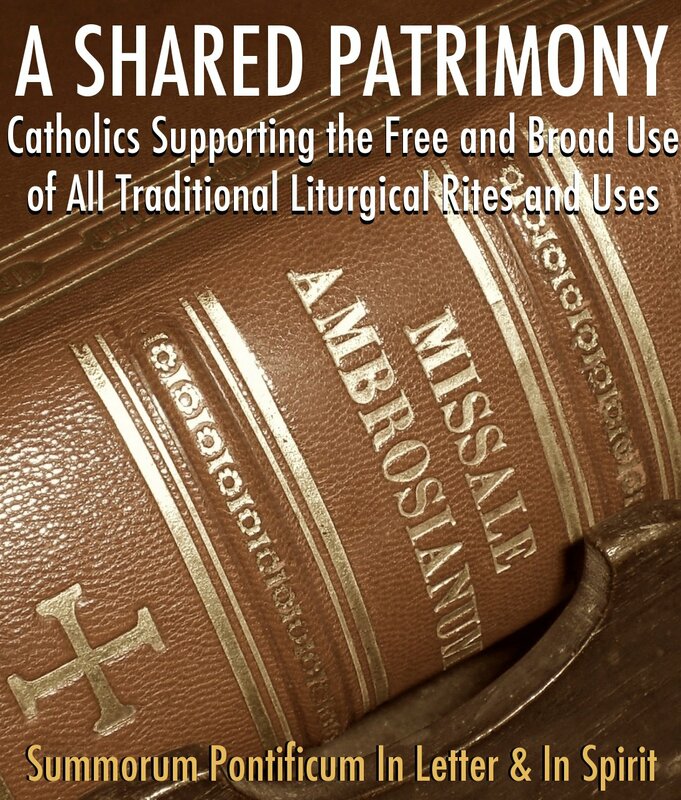 It would appear from the printed liturgical books of the era that the office of St. Thomas was adopted throughout the diocese as part of this reform. 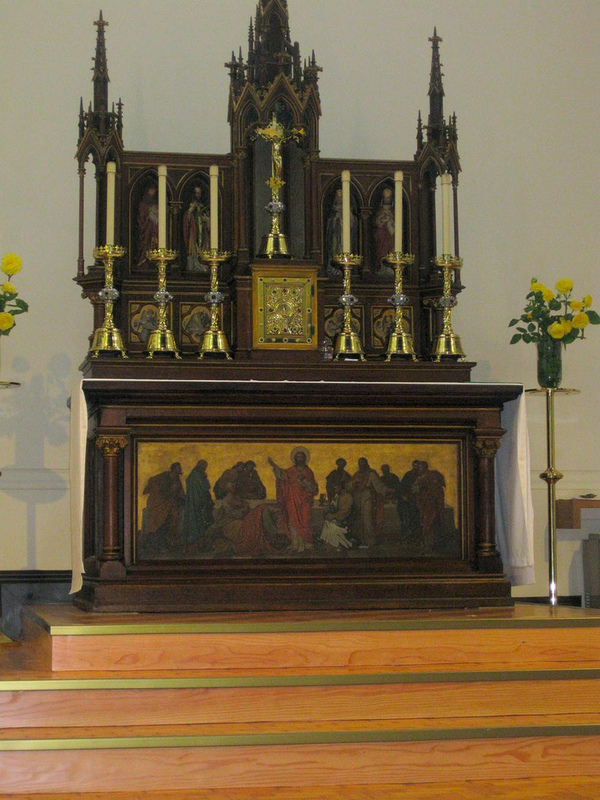 At the church of St. Martin, however, where the feast of Corpus Christi was first celebrated, several parts of the older office Animarum cibus were added to St. Thomas’; among them, proper hymns are assigned to the minor hours of Prime, Terce, Sext and None. 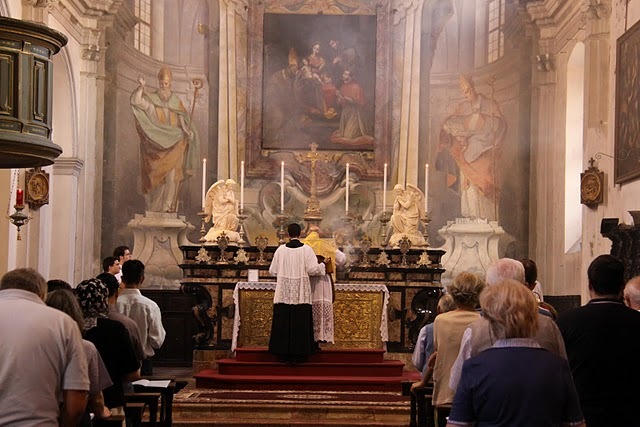 (This was done in some parts of the Low Countries on a very small number of feasts, where the use of Rome has the same hymns at these hours every day of the year.) As was typical of the period, several lines are borrowed from other hymns already part of the general repertoire; for example, the first line of the hymn of Prime, “Summae Jesu clementiae” is borrowed from a much older hymn “Summae Deus clementiae”. Grant this, Father, through the Son, and through the Holy Spirit, and a properous end to those to whom you give this food. Nobis quod se non abstulit. The mysteries of devotion, covered by a sacred veil, feed our souls with the same sweetness that fills those in heaven. Let this then be the joy which we share with them, that He has made Himself present to them, and Has not (by so doing) removed Himself from us. 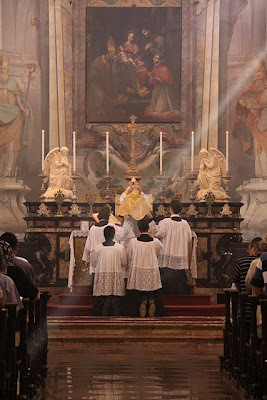 Splendor of heavenly light, and sacrifice of praise, grant the banquet of your Divine presence after that of your flesh. For this were you weighed down with reproaches, this nailed to the Cross, derided and mocked, and punished with a cruel death. The Mass of St. Gregory the Great, by Robert Campin, 1440, or an assistant. Each of these hymns contains a specific reference to the canonical hour at which it would be sung. The words “in every moment guide our manners, life and works” in the first hymn fit with one of the main ideas of the hour of Prime, to pray for the the sanctification of the day’s work; this is also expressed by the two invariable prayers of that Hour in the Roman Rite and most other uses. 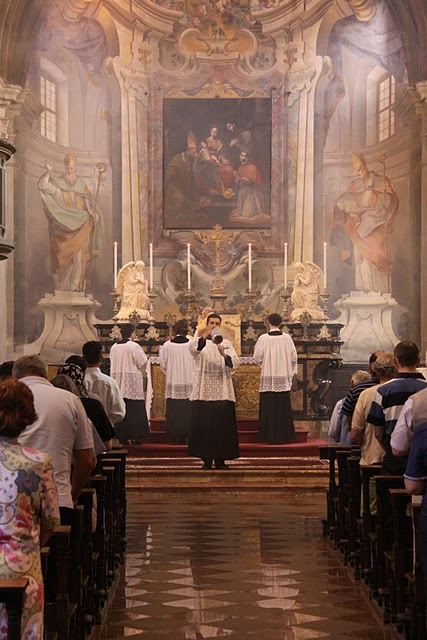 The references to receiving Communion in the hymn Sacro tecta velamine derive from the generally observed custom of the Middle Ages that the principle Mass of all major feast days was celebrated after the singing of Terce. The hymn for Sext refers to the Crucifixion which took place “at the sixth hour”, as St. Matthew says, and that of None speaks of the death of Christ at the ninth hour, and His crying out “I thirst” just before, as told in the Gospel of St. John. Aurelius Prudentius Clemens (ca. A.D. 348-413), better known simply as Prudentius, was a Roman Christian poet, and of noted interested for today's great feast is his poem, taken from his Liber Peristephanon (Book of the Martyrs Crowns), the Passion of the Apostles Peter and Paul (Passio Apostolorum Petri et Pauli). Whenever I read Prudentius, I am always interested in what one might historically glean from him and I would draw your attention to the first two stanzas of this poem, as well as to the last eleven. There we are given some sense of the festivities that occurred within Rome surrounding the feast of these two apostles. We read for example: "More than their wont do the people flock hither today; my friend pray tell me why do they hurry throughout Rome rejoicing?" And still further: "Mark how the people of Romulus surge through the streets in both directions, for two feasts on this day are celebrated. 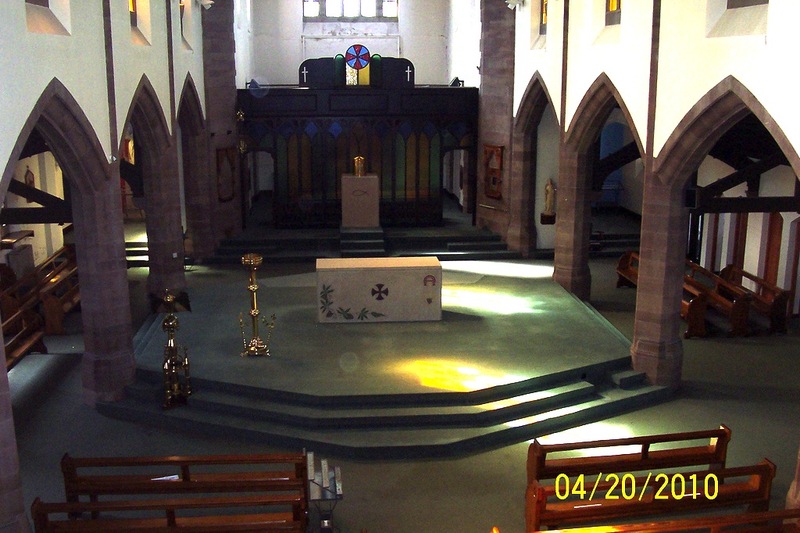 Now with glad steps let us hasten to visit these holy sanctuaries, and there let us unite in hymns of joy. First we shall go by the road that leads over the mighty bridge of Hadrian, and later we will seek the stream's left margin. After the vigil the Pontiff officiates first across the Tiber, then hither hastens to renew the offering." We celebrate a great feast today indeed. Why do they hurry throughout Rome rejoicing? By blood of Peter and of Paul made sacred. Of laurels won by glorious death in battle. Know that its soil by these twin crowns was hallowed. Of crimson rain upon its grassy meadows. To die, upon a lofty tree suspended. So that the crown unto the base extended. His soul more noble as his frame was humbled. He bowed his head in giving up his spirit. And that day dawned again on earth's horizon. And straightaway ordered Paul to be beheaded. "I long to be with Christ, my course is finished." The hour and day were those of his foretelling. Both banks made holy by their sacred ashes. Mid olives gray and near a purling fountain. Forever fruitful of the holy chrism. At least emerging in a verdant basin. Into a deep and icy pool of water. The ceiling seems to dance upon the billows. The temple that to Paul is dedicated. And poured upon its walls his boundless riches. As is the morning sun at its first rising. Adorn the central aisle in fourfold order. To be revered by togaed Rome forever. For two feasts on this day are celebrated. And there let us unite in hymns of joy. And later we will seek the stream's left margin. Then hither hastens to renew the offering. Remember thus to keep this double feast day! Above all beauty that this world can e'er impart. The Feast of Ss. Peter and Paul is worth noting for any number of reasons, including the fact that it is today that the Pope bestows the pallia on the new metropolitan archbishops. 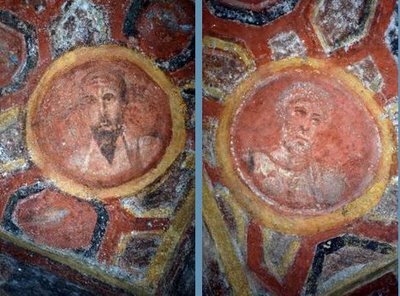 However, of primary importance is the commemoration of these two great apostles themselves of course, both of whom were martyred in Rome. The whole world, dearly-beloved, does indeed take part in all holy anniversaries, and loyalty to the one Faith demands that whatever is recorded as done for all men's salvation should be everywhere celebrated with common rejoicings. But, besides that reverence which today's festival has gained from all the world, it is to be honoured with special and peculiar exultation in our city, that there may be a predominance of gladness on the day of their martyrdom in the place where the chief of the Apostles met their glorious end. For these are the men, through whom the light of Christ's gospel shone on you, O Rome, and through whom you, who wast the teacher of error, wast made the disciple of Truth. These are your holy Fathers and true shepherds, who gave you claims to be numbered among the heavenly kingdoms, and built you under much better and happier auspices than they, by whose zeal the first foundations of your walls were laid: and of whom the one that gave you your name defiled you with his brother's blood. These are they who promoted you to such glory, that being made a holy nation, a chosen people, a priestly and royal state 1 Peter 2:9, and the head of the world through the blessed Peter's holy See you attained a wider sway by the worship of God than by earthly government. For although you were increased by many victories, and extended your rule on land and sea, yet what your toils in war subdued is less than what the peace of Christ has conquered. For the good, just, and Almighty God, Who has never withheld His mercy from mankind, and has ever instructed all men alike in the knowledge of Himself by the most abundant benefits, has by a more secret counsel and a deeper love shown pity upon the wanderers' voluntary blindness and proclivities to evil, by sending His co-equal and co-eternal Word. Which becoming flesh so united the Divine Nature with the human that He by lowering His Nature to the uttermost has raised our nature to the highest. But that the result of this unspeakable Grace might be spread abroad throughout the world, God's Providence made ready the Roman empire, whose growth has reached such limits that the whole multitude of nations are brought into close connection. For the Divinely-planned work particularly required that many kingdoms should be leagued together under one empire, so that the preaching of the world might quickly reach to all people, when they were held beneath the rule of one state. And yet that state, in ignorance of the Author of its aggrandisement though it rule almost all nations, was enthralled by the errors of them all, and seemed to itself to have fostered religion greatly, because it rejected no falsehood. And hence its emancipation through Christ was the more wondrous that it had been so fast bound by Satan. For when the twelve Apostles, after receiving through the Holy Ghost the power of speaking with all tongues, had distributed the world into parts among themselves, and undertaken to instruct it in the Gospel, the most blessed Peter, chief of the Apostolic band, was appointed to the citadel of the Roman empire, that the light of Truth which was being displayed for the salvation of all the nations, might spread itself more effectively throughout the body of the world from the head itself. What nation had not representatives then living in this city; or what peoples did not know what Rome had learned? Here it was that the tenets of philosophy must be crushed, here that the follies of earthly wisdom must be dispelled, here that the cult of demons must be refuted, here that the blasphemy of all idolatries must be rooted out, here where the most persistent superstition had gathered together all the various errors which had anywhere been devised. To this city then, most blessed Apostle Peter, you dost not fear to come, and when the Apostle Paul, the partner of your glory, was still busied with regulating other churches, entered this forest of roaring beasts, this deep, stormy ocean with greater boldness than when you walked upon the sea. And you who had been frightened by the high priest's maid in the house of Caiaphas, had no fear of Rome the mistress of the world. Was there any less power in Claudius, any less cruelty in Nero than in the judgment of Pilate or the Jews' savage rage? So then it was the force of love that conquered the reasons for fear: and you did not think those to be feared whom you had undertaken to love. But this feeling of fearless affection you had even then surely conceived when the profession of your love for the Lord was confirmed by the mystery of the thrice-repeated question. And nothing else was demanded of this your earnest purpose than that you should bestow the food wherewith you had yourself been enriched, on feeding His sheep whom you loved. Your confidence also was increased by many miraculous signs, by many gifts of grace, by many proofs of power. You had already taught the people, who from the number of the circumcised had believed: you had already founded the Church at Antioch, where first the dignity of the Christian name arose: you had already instructed Pontus, Galatia, Cappadocia, Asia, and Bithynia, in the laws of the Gospel-message: and, without doubt as to the success of the work, with full knowledge of the short span of your life carried the trophy of Christ's cross into the citadel of Rome, whither by the Divine fore-ordaining there accompanied you the honour of great power and the glory of much suffering. Thither came also your blessed brother-Apostle Paul, "the vessel of election Acts 9:15," and the special teacher of the Gentiles, and was associated with you at a time when all innocence, all modesty, all freedom was in jeopardy under Nero's rule. Whose fury, inflamed by excess of all vices, hurled him headlong into such a fiery furnace of madness that he was the first to assail the Christian name with a general persecution, as if God's Grace could be quenched by the death of saints, whose greatest gain it was to win eternal happiness by contempt of this fleeting life. "Precious," therefore, "in the eyes of the Lord is the death of His saints :" nor can any degree of cruelty destroy the religion which is founded on the mystery of Christ's cross. 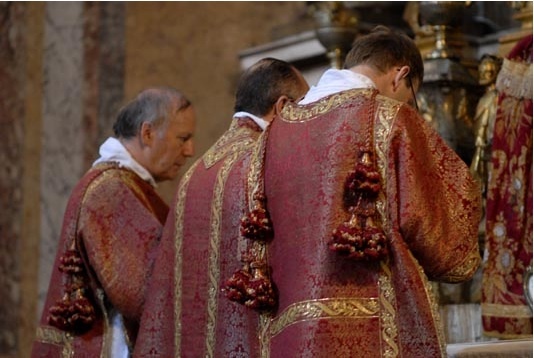 Persecution does not diminish but increase the church, and the Lord's field is clothed with an ever richer crop, while the grains, which fall singly, spring up and are multiplied a hundred-fold. Hence how large a progeny have sprung from these two Heaven-sown seeds is shown by the thousands of blessed martyrs, who, rivalling the Apostles' triumphs, have traversed the city far and wide in purple-clad and ruddy-gleaming throngs, and crowned it, as it were with a single diadem of countless gems. And over this band, dearly-beloved, whom God has set forth for our example in patience and for our confirmation in the Faith, there must be rejoicing everywhere in the commemoration of all the saints, but of these two Father.' excellence we must rightly make our boast in louder joy, for God's Grace has raised them to so high a place among the members of the Church, that He has set them like the twin light of the eyes in the body, whose Head is Christ. About their merits and virtues, which pass all power of speech, we must not make distinctions, because they were equal in their election , alike in their toils, undivided in their death. But as we have proved for ourselves, and our forefathers maintained, we believe, and are sure that, amid all the toils of this life, we must always be assisted in obtaining God's Mercy by the prayers of special interceders, that we may be raised by the Apostles' merits in proportion as we are weighed down by our own sins. Through our Lord Jesus Christ, etc. From the Breviary of Prague, 1502, the continuation of the Bull "Transiturus" of Pope Urban IV, promulgating the feast of Corpus Christi, read in the Divine Office for the lessons of Matins during the octave. (On the feast of Corpus Christi) let hearts and prayers, mouths and lips bring forth hymns of saving joy; let faith sing, let hope dance, let charity exult, let devotion be well-pleased, let piety cry out for joy, and sincerity be glad. Let all come together with eager spirit and ready will, showing their zeal in praiseworthy manner as they celebrate the solemnity of so great a feast. And we pray that ardent love so enkindle the faithful of Christ to His service, that through these celebrations (and other such) they may advance ever more greatly in merit before Him who gave Himself as the price of their redemption, and now gives Himself to them as food; and finally, that He may bestow Himself upon them as their reward after this life. It is now official. As discussed late last week, the Patriarch of Venice, Angelo Cardinal Scola, has been named by the Holy Father as the next Cardinal Archbishop of the venerable see of Milan. Ha nominato il Cardinale Angelo Scola, Arcivescovo Metropolita di Milano (superficie: 4.208; popolazione: 5.334.788; cattolici: 4.887.611; sacerdoti: 2.870; religiosi: 7.316; diaconi permanenti: 118), Italia. Finora Patriarca di Venezia (Italia), il Cardinale Scola succede al Cardinale Dionigi Tettamanzi, del quale il Santo Padre ha accettato la rinuncia al governo pastorale della medesima Arcidiocesi, presentata per raggiunti limiti d’età. Liège in Belgium used to be described as the "Paradise of priests." The many important churches that adorn the city center testify to its rich Catholic past, when the bishop of Liege was prince of the Holy Roman Empire. Unfortunately, the faith has declined here as often in Belgium; even in the city where Corpus Christi was established in 1246 after the visions of St. Juliana of Cornillon, the procession of the Blessed Sacrament had disappeared since the 1970's. 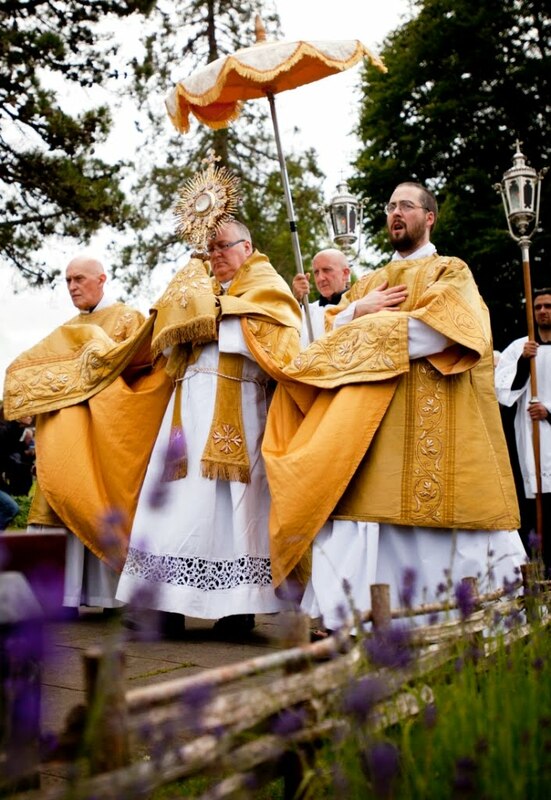 But for the second year in a row, an association of laypeople have given great solemnity to the feast of Corpus Christi in Liège. 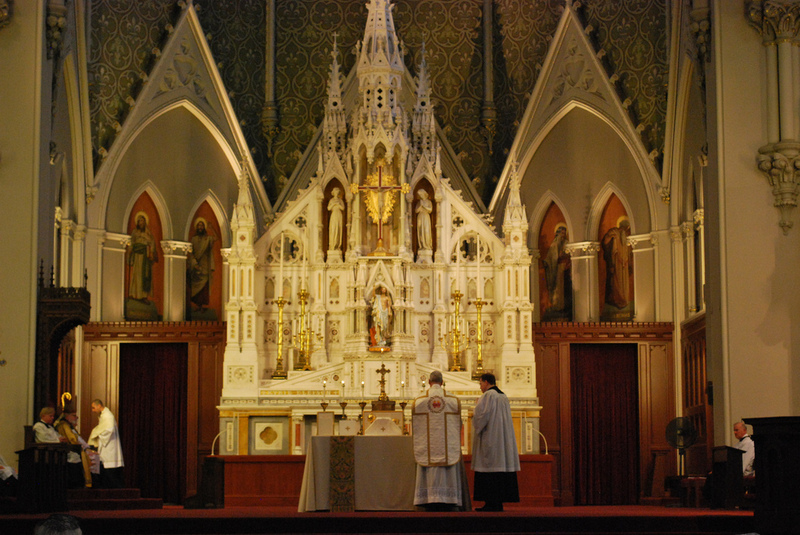 The Mass and the procession take place in the beautiful church of the Blessed Sacrament, saved from closure by the association who bought it few years ago. 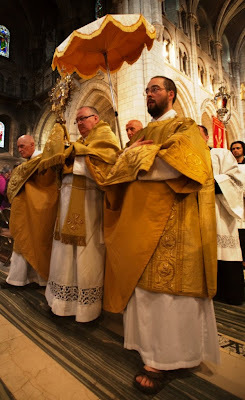 The solemn Mass of Corpus Christi was celebrated by Canon Vanderbruggen, O.Praem., rector of the Shrine of Tancrémont, assisted by Fr Jean-Pierre Herman and Fr Claude Germeau. The Schola Sainte Cecile was invited from Paris and sing works by French and local Belgian composers of the 17th century. More information is available via the organizers blog. 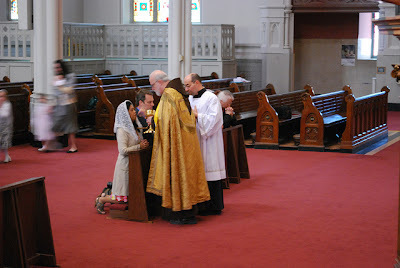 More pictures from the blog of Schola Sainte Cécile. When we were in a lesser office, most beloved, we learned that it was divinely revealed to certain Catholics that such a feast ought to be generally celebrated. 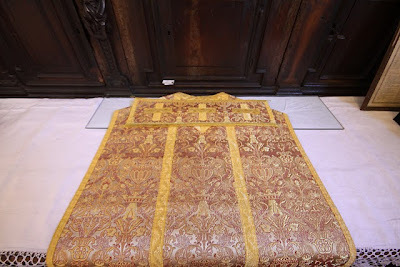 Therefore, for the strengthening and exaltation of the Catholic faith, we have deemed it worthy and reasonable to decree that a special and more solemn yearly memorial of so great a sacrament should be celebrated, apart from the daily commemoration which the Church makes thereof; and we designate and appoint a certain day for this purpose, to wit, the first Thursday after the octave of Pentecost, so that on that day, the faithful may with devotion and affection come to the churches, and both the clergy and people rejoicing together may rise up in songs of praise. In response to the interest of a handful of young men and boys interested in serving the Dominican Rite here in Anchorage, we are offering a Dominican Rite Server Camp. To our astonishment twenty-five current and potential acolytes have signed up! Br. Peter Hannah, O.P. will be the main instructor in the rubrics. 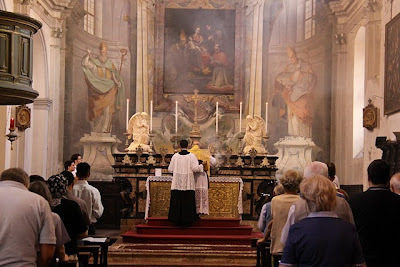 Each day a Mass in the Dominican Rite will be offered by me (Fr. 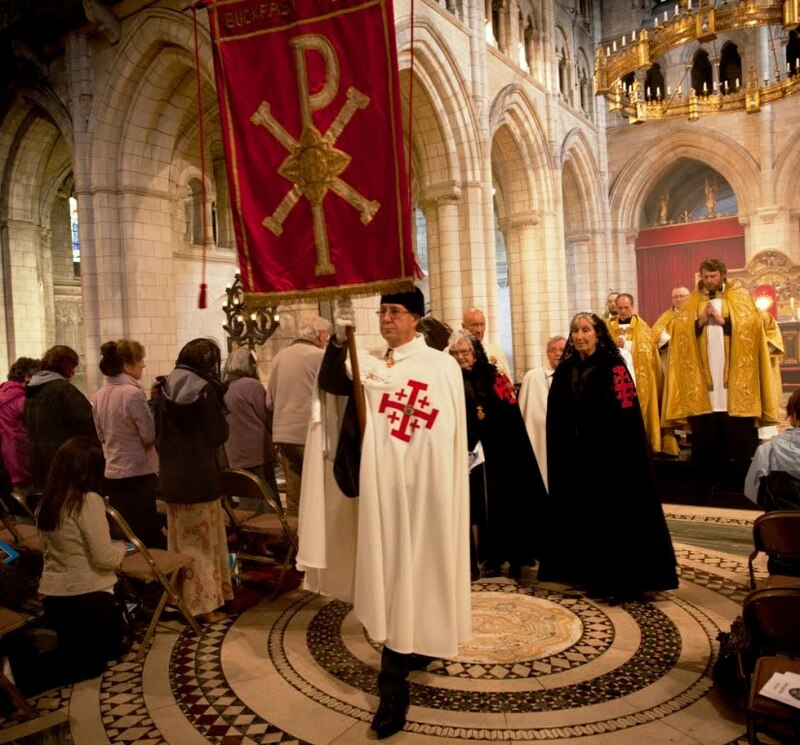 Vincent Kelber, O.P) While the classes are private, the Masses will be public and in the Cathedral. All are very welcome to attend. Please see the schedule below. Fr. Augustine also invited me to share on the development and growth of the Dominican Rite here in Anchorage. I will be sharing a few photos and some commentary within the next couple of days. I am very thankful to have been alerted to this 'before and after' renovation post by Fr. Finigan. It is the parish of St. Joseph's, Longsight, Manchester in the UK. I will leave many of the details to Fr. Finigan himself, inviting you to go over there to read all about it. But a quick look and a few quick thoughts. In the after photograph one can clearly see how something closer to the original sanctuary arrangement has been restored -- and to great effect. Not only has additional seating been regained in the nave, more importantly, I would suggest that the altar actually has a greater, more intuitive iconic centrality. 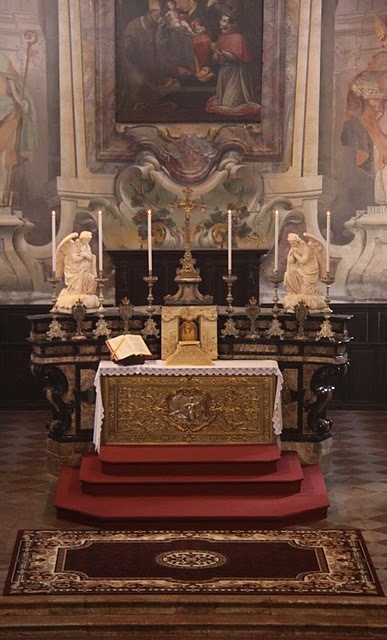 I would attribute this to a few factors, including the form of the altar, its greater height (by means of both the predella and the reredos) and its harmony with the rest of the architecture. The church now also benefits from being less dark than in the previous arrangement which is also a help. 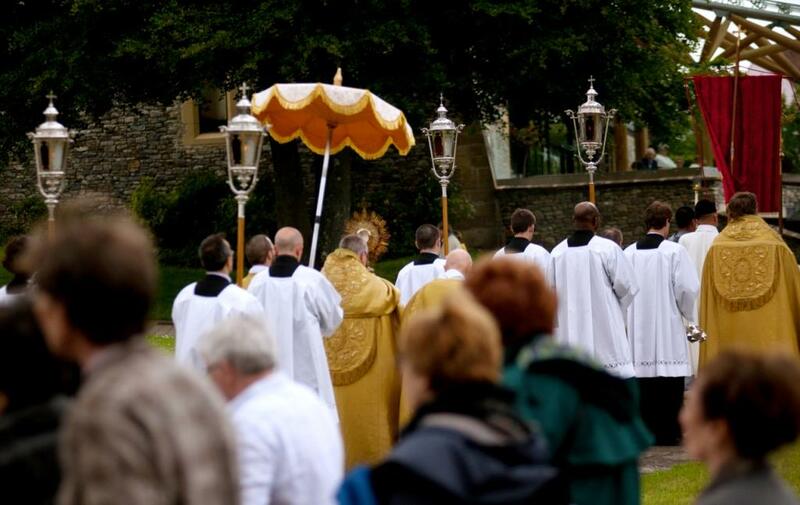 As our readers will know, each year in Cork, Ireland, a liturgical conference is held: Fota. This year will be the 4th Fota Liturgical conference on the topic of "Benedict XVI and the Roman Missal" and it is being held from July 9th-11th -- which means there is still time to make plans to attend. We have already given you a flavour of what you can expect (see here and here for example), but permit us to share again what is going on. 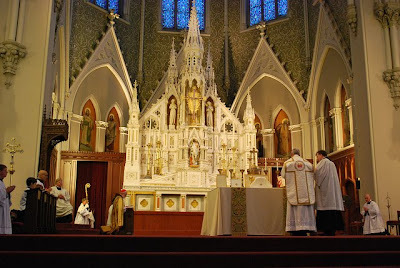 This year's Fota conference is particularly noteworthy, incorporating a consideration of both forms of the Roman Missal -- very "Benedictine" -- not to mention the matter of the Anglican ordinariate. While the following documents are draft versions, they will give you a good sense of the speakers and their topics -- which is impressive. This may be a good time to remind our readers as well that the proceedings of the Fota liturgical conference are published in a very nice hardcover format by Four Courts Press. 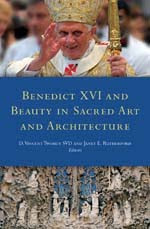 As noted back in April, just released were the proceedings of the 2nd Fota conference on Benedict XVI and Beauty in Sacred Art and Architecture. Published in May 2010 were the proceedings of the 1st Fota conference on Benedict XVI and the Sacred Liturgy. This bread is received, but not truly consumed, it is eaten, but not changed, since it is not transformed within the one who eats; but if it be worthily received, to it is the receiver conformed. O most excellent sacrament! 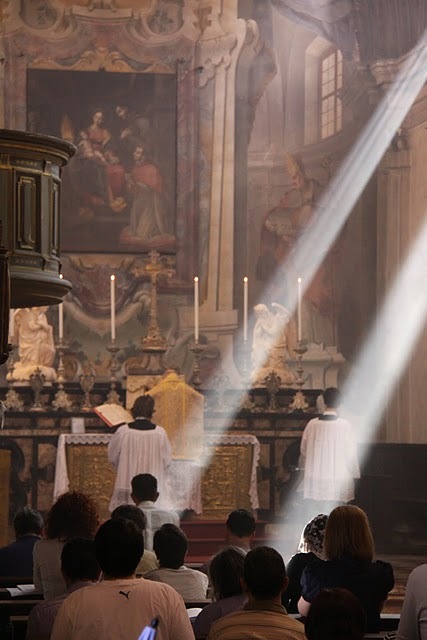 which we must venerate, adore, worship, glorify and love, magnify with special praises, exalt with worthy hearts, honor with all zeal, accompany with devout service, and remember with sincerity. O most noble memorial! which we must commend to the depth of our hearts and diligently keep therein, bind firmly to our minds, and recall with constant meditation and celebration. We must celebrate the memory of this (sacrament) continually, that we may be always mindful of Him, whose memorial we know it to be; for the memory of one whose gift or favor is the more often seen, must be the more strictly kept. 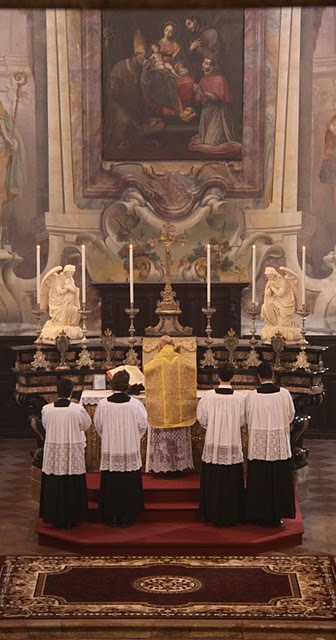 Therefore, although this sacrament in His memory is frequented in the daily solemnity of the Mass, nevertheless we deem it fitting and worthy that at least once in the year, the memorial thereof be kept with greater celebration and solemnity, especially to confound the unbelief and insanity of the heretics. 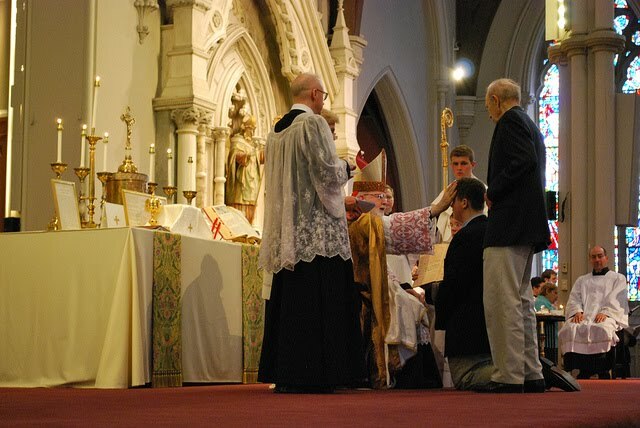 For on the day of the Lord’s Supper, on which day Christ Himself instituted this sacrament, the universal Church, being very much occupied with the reconciliation of the pentients, the making of the sacred Chrism, the fulfillment of the commandment concerning the washing of the feet, and other things, cannot be fully free for the celebration of this greatest sacrament. Here are some works by the Spanish artist Kiko Arguello. I had never heard of him until I visited Spain about five years ago. 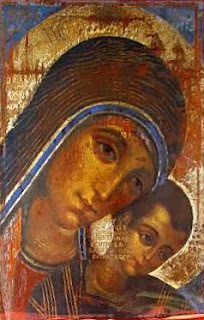 On a tour of the cathedral in Granada, I was shown a small painting by him similar to the one shown here, below. It is obviously derived from the iconographic style, yet having a modern feel in a way that does not take away, in my opinion, from the contemplative nature of the form. I have seen very few examples since and have struggled to find very many. I would love to see some more if anyone out there can point us in the right direction? 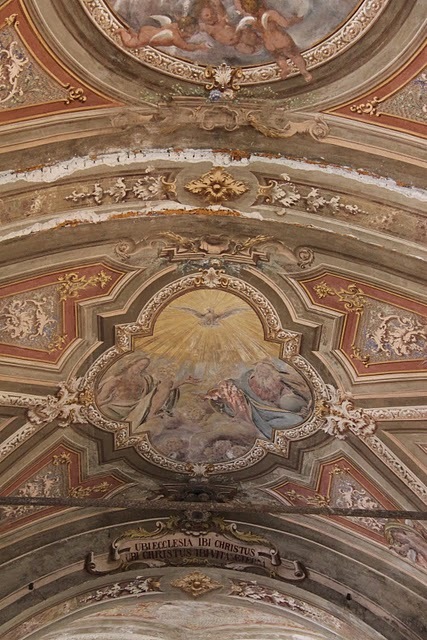 The painting below is a fresco. In spirit do we embrace all the other things whose memory we keep, but we do not obtain their real presence because of this; but in this sacramental commemoration, Jesus Christ, though present under another form, is nevertheless with us in His own substance. 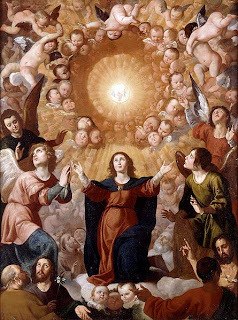 For when He was about to ascend into Heaven, He said to the Apostles and their followers, “Behold I am with you all days, even unto the consummation of the world,” strengthening them with this kindly promise, that He would remain and be with them even in His bodily presence. O worthy memorial, that must never be interrupted, in which we recall that our death died, that our destruction was destroyed, and the tree of life, being marked with the sign of the Cross, bore the fruit of salvation for us. This is the glorious commemoration, which fills the minds of the faithful with saving joy, and with an outpouring of gladness brings also tears of devotion. Let us rejoice indeed as we remember our liberation, and recall the Lord’s passion… O the immensity of God’s love, the superabundance of His compassion, the profusion of His bounty! For the Lord has given us all things, He has subjected them beneath our feet, and over all the creatures of the earth has given us dominion. Even by His ministers among the higher spirits He has ennobled and raised up the dignity of man; for they are all ministering spirits, sent to minister for them, who shall receive the inheritance of salvation. Milan. 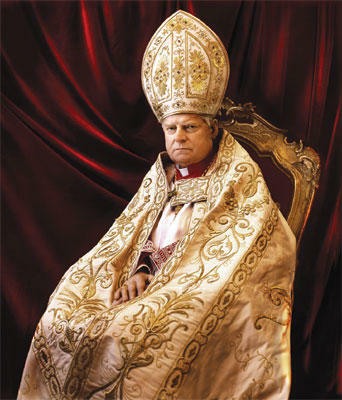 This particular appointment has been long wondered about; for some it is for reason of the particular influence of the See in question, while for others the outstanding liturgical question of the usus antiquior Ambrosianus -- outstanding for the reason that there is an ever-growing sense that the faithful of Milan have not been afforded the full benefit of the principles or the spirit of the motu proprio Summorum Pontificum by way of the free use of their own ancient and venerable liturgical books. While most sources still denote him as only a "strong possibility," Magister today takes it a step further, stating rather matter of factly that it is Scola who will be named to Milan: "The current patriarch of Venice is about to be named archbishop of the diocese of his birth." Checking the Vatican website, as well as other Italian sources, such as Tornielli, Rodari and the new Vaticaninsider.com website, I see no further statements to this effect. Accordingly, I think we are still left to wait and see whether Magister's statement is one of insider fact or one of prophecy. As I have noted countless times, the Roman Martyrology is a great way to keep in contact with the early Roman martyrs and it reminds us of what our early Christian ancestors went through for the Faith. 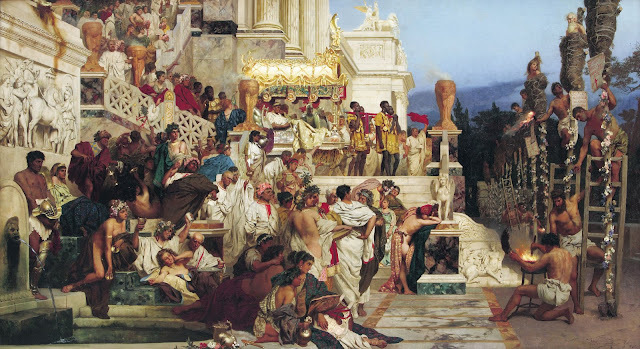 For the entry for June 24th we are reminded of this particularly famous and gruesome episode under the cruel Emperor, Nero -- an emperor whose cruelty is commented on thoroughly by Suetonius in his Lives of the Caesars. At Rome, in the time of Nero, the commemoration of many holy martyrs. Being falsely accused of having set fire to the city, they were cruelly put to death in various manners by the emperor's order. Some were covered with the skins of wild beasts and torn to pieces by dogs, other were fastened to crosses, others again were delivered to the flames to serve as torches in the night. All these were disciples of the apostles, and the first fruits of the martyrs which the Roman Church, a field so fertile in martyrs, offered to God even before the death of the Apostles. Consequently, to get rid of the report, Nero fastened the guilt and inflicted the most exquisite tortures on a class hated for their abominations, called Christians by the populace... an arrest was first made of all who pleaded guilty; then, upon their information, an immense multitude was convicted, not so much of the crime of firing the city, as of hatred against mankind. Mockery of every sort was added to their deaths. Covered with the skins of beasts, they were torn by dogs and perished, or were nailed to crosses, or were doomed to the flames and burnt, to serve as a nightly illumination, when daylight had expired. Since it is Corpus Christi today, it is fitting to show this image of the chapel of the Blessed Sacrament (or French chapel) from the Basilica of Santa Casa in Loreto. The chapel features painted scenes, by C. Lameire (1896-1912), showing episodes from the life of St. Louis IX at Nazareth, as well as the battle of the Knights Templar defending Nazareth. 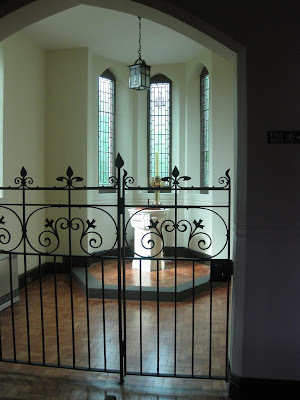 We have shown some examples of wrought ironwork in our churches in the past (a simple but impressive and beautiful artistic feature which I think merits more consideration today) and I would like to highlight the wrought-iron railing by E. Mattaccotta. Indeed, it was this ironwork which actually first caught my attention and drew my eye to this chapel. Pope Benedict on the Psalms: "The Book of Prayer Par Excellence"
VATICAN CITY, 22 JUN 2011 ( VIS ) - Benedict XVI dedicated his catechesis during this morning's general audience to what he described as "the book of prayer par excellence, the Book of Psalms". The audience was held in St. Peter's Square in the presence of 10,000 people. The 150 Psalms of the Book of Psalms "express all human experience", said the Pope. "All the truth of the believer comes together in those prayers, which first the People of Israel and later the Church adopted as a special way to mediate their relationship with the one God, and as an adequate response to His having revealed Himself in history". "Despite the many forms of expression they contain", the Psalms "can be divided into two broad categories: ... supplication associated with lamentation, and praise. These two dimensions are related, almost indivisible, because supplication is animated by the certainty that God will respond, and this opens the way to praise and thanksgiving; while praise and thanksgiving arise from the experience of salvation received, which presupposes the need for help expressed in the supplication. ... Thus, in the prayer of the Psalms, supplication and praise intertwine and fuse together in a single song which celebrates the eternal grace of the Lord as He bows down to our frailty". "The Psalms teach us to pray", the Holy Father explained. "In them, the Word of God becomes the word of prayer. ... People who pray the Psalms speak to God with the words of God, addressing Him with the words He Himself taught us. ... Through these words it is also possible to know and accept the criteria of His actions, to approach the mystery of His thoughts and His ways, so as to grow and develop in faith and love". "By teaching us to pray", the Pope went on, "the Psalms also teach us that at times of desolation, even in moments of suffering, the presence of God is a source of wonder and consolation. We may weep, plead and seek intercession, ... but in the awareness that we are advancing towards the light, where praise will be unending". "Equally important and significant are the manner and frequency in which the words of the Psalms appear in the New Testament, where they assume and underline that prophetic significance suggested by the link of the Book of Psalms with the messianic figure of David. In His earthly life the Lord Jesus prayed with the Psalms, and in Him they reach definitive fulfilment and reveal their fullest and deepest meaning. The prayers of the Book of Psalms, with which we speak to God, speak to us of Him, they speak of the Son, image of the invisible God Who fully reveals the Father's face to us. Thus Christians, by praying the Psalms, pray to the Father in Christ and with Christ, seeing those songs in a new perspective which has its ultimate interpretation in the Paschal Mystery". 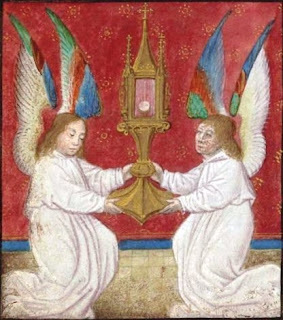 As Gregory DiPippo reminds us today, in 1246, when the Prince-Bishop of Liège, Robert of Torote, established in his diocese the celebration of Corpus Christi after the visions of St. Juliana of Mont-Cornillon, it was necessary to establish an office & a mass for the new feast. The composition of new texts and melodies was given to Jean of Cornillon, priest, who worked in collaboration with St. Juliana. After the Eucharistic miracle of Bolsena in 1263, Pope Urban IV, former confessor of St. Juliana, extended to the whole Church the feast of Corpus Christi by the bull "Transiturus de hoc mundo" of September 8, 1264. 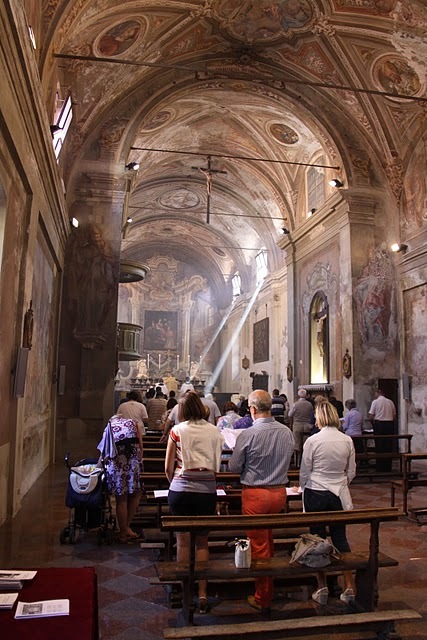 The Pope then asked St. Thomas Aquinas to compose a new office and a new Mass, and it is the admirable work done by St. Thomas that we still sing today, with parts universally known as the hymn Pange lingua, the Magnificat antiphon O quam suavis est or the sequence Lauda Sion. However, in the principality of Liège itself, the former office composed by John of Cornillon survived before being gradually supplanted by that of St. Thomas Aquinas, and disappeared completely in the sixteenth century. 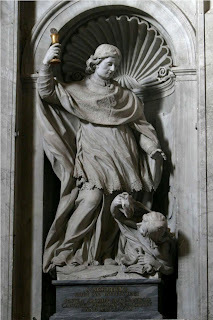 Certainly, the work of St. Thomas is unbeatable by its theological density, but that of Jean of Cornillon was not without merit, in particular, one can appreciate the real beauty of its music; the chant is original composition, where St. Thomas centonized most often, that is to say, takes all the great "hits" of the Roman plain-song by providing new texts. This year, our Schola Sainte Cecile of Paris will have the grace to sing the mass and the procession of Corpus Christi in Liège, the city itself where this beautiful feast was first established under the name of Festum Eucharistiae, the Feast of the Eucharist. 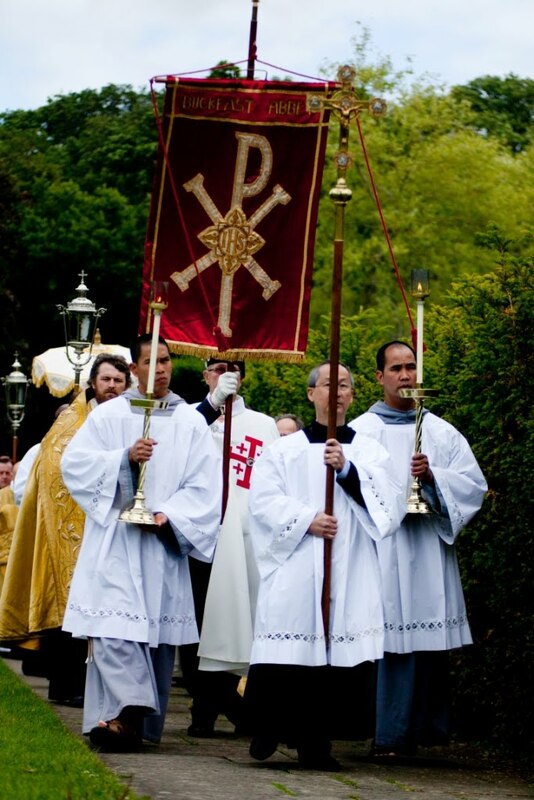 The mass will be next saturday and will be followed by the procession. Here is the web site of the event. Of course, we will use the Roman books but we will sing some pieces from the old office of Jean de Cornillon for the Benediction. These beautiful pieces from the old books of Liège might be used elsewhere for Benedictions or as motets. 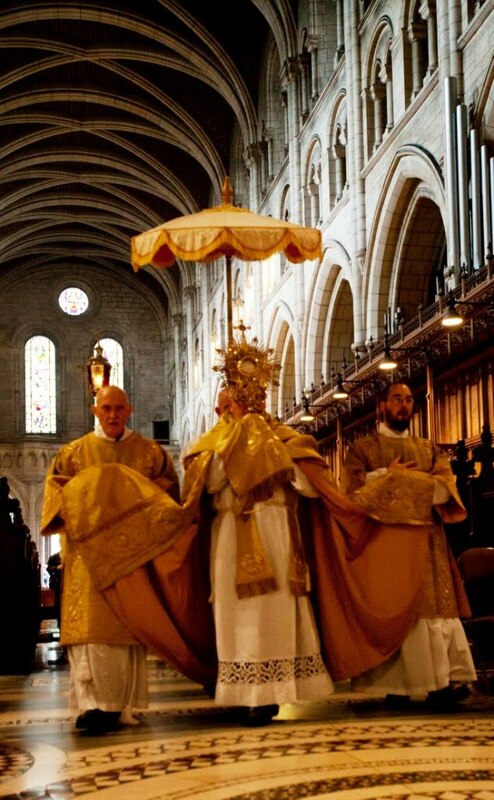 A joyful feast of Corpus Christi to all the readers of the New Liturgical Movement. Source: Dom C. Lambot, Dom I. Fransen, L'Office de la Fête-Dieu primitive - Textes & mélodies retrouvées. Editions de Maredsous, 1946. 104 pages. Book printed for the festivities of the seventh centenary of the institution of the feast of Corpus Christi in Liège in 1946. From the life of St. Juliana of Mont-Cornillon, sometimes called Juliana of Liège, according to the 1791 Breviary of Liège. 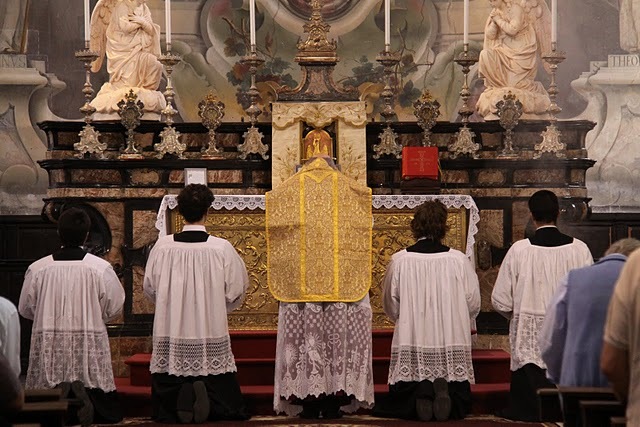 The Most High God, who chooses the weak things of this world, wondrously deigned to elect (this) humble virgin, endowed with a singular grace, to obtain a special feast of His Body. For as she lay prostrate daily before the most august Sacrament of the Eucharist, she learned by divine revelations that a special solemnity of the Body of Christ was to be instituted. When she declared these revelations to certain holy and learned men, the matter was examined in due time, and they judged that such a solemnity would be useful to further the glory of God and the devotion of Christ’s faithful towards the most holy and august Sacrament of the Eucharist; and so they and she induced the bishop to institute the feast. 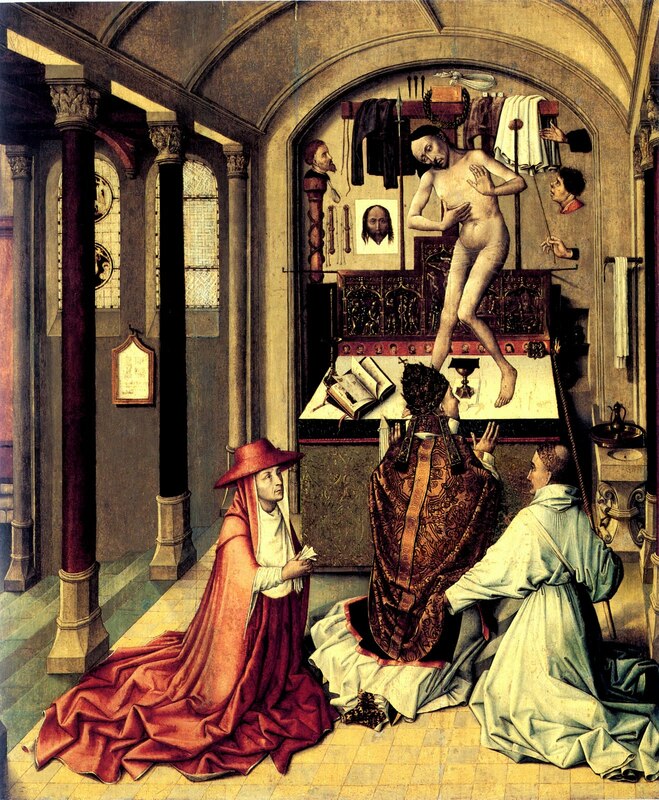 The first to do so was Bishop Robert of Liège in the year 1246, who commanded that it be celebrated throughout his diocese; at the behest of the Blessed Eve, the companion of Juliana, Urban IV afterwards gave his approval, and extended the feast to the universal church. St. Juliana died in the year 1252, nine years before the former archdeacon of her native city, Jacques Pantaléon, was elected to the papacy with the name Urban IV; he is one of the “learned men” referred to above who were consulted on the propriety of adding a feast to the Temporal Cycle of the liturgical year. 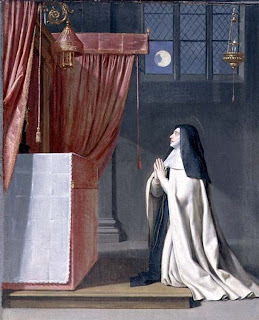 The vision to which Juliana’s legend refers was one of a full moon with a dark spot on it, which appeared to her both day and night over many years; the meaning of it was imparted to her by the Lord Himself, namely, that something was missing from the liturgical year, since there was no special feast to honor the Blessed Sacrament. The Vision of St. Juliana, by Philippe de Champaigne, ca. 1650. (a)lthough on the day of the (Lord’s) Supper, when we know the Sacrament to have been instituted, a special mention is made of this fact in the solemn Mass, nevertheless, all the rest of the day’s services pertains to Christ’s Passion, which the Church is concerned to venerate at that time. In order that the faithful may once again honor the institution of so great a Sacrament with its own service, the Roman Pontiff Urban IV, moved by his devotion to It, piously decreed that the memory of this institution should be celebrated by all the faithful on the first Thursday after the Octave of Pentecost, so that we who make use of this Sacrament throughout the year unto our salvation, may specially honor Its institution at that time when the Holy Spirit taught the hearts of the disciples to know the mysteries thereof; for at the same time did the Sacrament begin to be frequented by the faithful. The bull “Transiturus” by which Pope Urban established the feast in 1264, the last year of his short pontificate, was in some places read in the Divine Office for the lessons of Matins during the octave of Corpus Christi; this was the custom in the medieval use of Prague, and in the post-Tridentine uses of Liège and of the Carthusian Order. 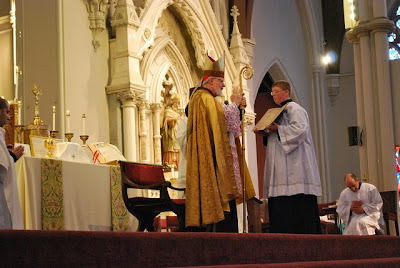 Bishop Urban, servant of the servants of God, to his venerable brethren the archbishops and their suffragans, greetings and apostolic blessing. When Our Savior, the Lord Jesus Christ, was about to pass from this world to the Father, as the time of His Passion drew nigh, having taken supper, He instituted unto the memory of His death the most exalted and magnificent Sacrament of His Body and Blood, giving His Body to eat and His Blood to drink. For however so often we eat this bread and drink this cup, we proclaim the death of the Lord. In the institution of this saving Sacrament, He said to the Apostles, “Do this in memory of Me”, so that this august and venerable Sacrament might be the special and particular memorial of the exceptional love with which He loved us: this memorial, I say, wondrous and astounding, full of delight, sweet, most secure, and precious above all things, in which signs are renewed and wonders changed, in which is contained every delight and the enjoyment of every savor, and the very sweetness of the Lord is tasted, by which we do indeed obtain the support of our life and salvation. This is the memorial most sweet, most sacred, most holy, profitable unto salvation, by which we recall the grace of our redemption; by which we are drawn away from evil and strengthened in good, and advance to the increase of virtues and graces, by the bodily presence of the Savior. Br. Lawrence recently posted about the first liturgical event of the Personal Ordinariate of Our Lady of Walsingham, which took place at Blackfriars in Oxford. Some of you were asking if more from the liturgy was available than just the still photos, and some audio clips have now been made available. We have often spoken here about the importance of knowledge of the Old Testament, biblical typology and what not, making reference to the Catechism's teaching on this same point. As such, I was rather interested in the following new title being made available by Ignatius Press, Jesus and the Jewish Roots of the Eucharist, written by Dr. Brant Pitre. 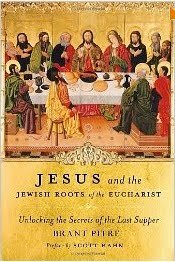 Jesus and the Jewish Roots of the Eucharist shines fresh light on the Last Supper by looking at it through Jewish eyes. Using his in-depth knowledge of the Bible and ancient Judaism, Dr. Brant Pitre answers questions such as: What was the Passover like at the time of Jesus? What were the Jewish hopes for the Messiah? What was Jesus' purpose in instituting the Eucharist during the feast of Passover? And, most important of all, what did Jesus mean when he said, "This is my body... This is my blood"? To answer these questions, Pitre explores ancient Jewish beliefs about the Passover of the Messiah, the miraculous Manna from heaven, and the mysterious Bread of the Presence. As he shows, these three keys-the Passover, the Manna, and the Bread of the Presence-have the power to unlock the original meaning of the Eucharistic words of Jesus. Along the way, Pitre also explains how Jesus united the Last Supper to his death on Good Friday and his Resurrection on Easter Sunday. Inspiring and informative, Jesus and the Jewish Roots of the Eucharist is a groundbreaking work that is sure to illuminate one of the greatest mysteries of the Christian faith: the mystery of Jesus' presence in "the breaking of the bread." I have not read the book, so can offer no particular comments, but I can tell you that Amazon has the "Look Inside" feature available for this book (and also offering a pretty good discount as well). The following images of Trinity Sunday in the Ambrosian rite in Legnano where brought to our attention. 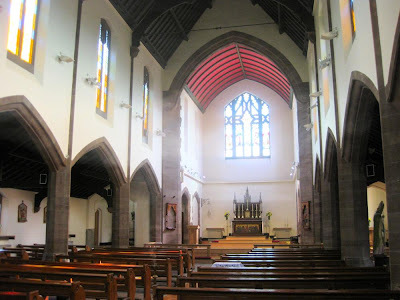 I was pleased to see some more photographs of some of the architectural details of the Church. See the full photoset here.